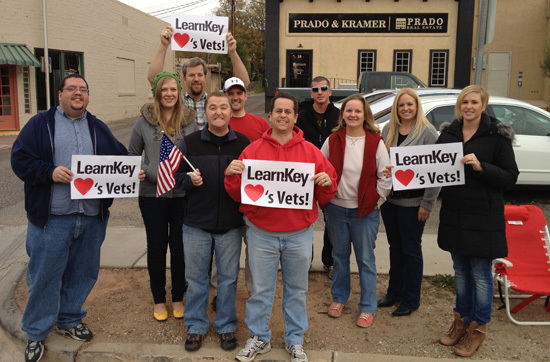 LearnKey has been working with the VA VR&E (Vocational Rehab and Employment) program for the last year. The VR&E program is specifically for those veterans who have partial service related disability and the goal is to help the veteran find suitable employment and careers. We offer a number of courses and bundled program packages for the veterans which range from Web design, Graphic design, Cisco Pro, Video production, SharePoint, Office 2010, QuickBooks, CompTIA, Project Management, Database design, Windows Server, etc. We even help the veterans to find jobs with employers where they will truly fit in with the company culture. I wanted you to know that just yesterday, we had one of the veterans we work with certify in CPEH (Certified Professional Ethical Hacker)! Chris L. has been studying using his LearnKey program that was provided by the VR&E program at the VA. He has been working hard and that work is certainly paying off. He is the first veteran in our program to attempt the CPEH and he will soon take the CPTE (Certified Pen. Testing Engineer) exam. Great job and good timing Chris, you managed to get that certification just in time for Veterans Day!